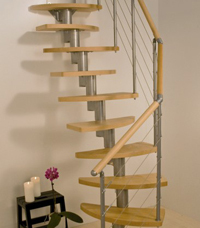 Stylish & Space-Saving Compact Stairs and Spiral Staircases in Surrey. 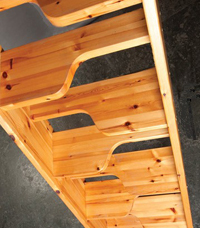 Compact 'Spacesaver' Stairs. An alternative to the full spiral from £999 fitted. Under Building Regulations, fixed ladders with two handrails are accepted for access to a habitable room in loft conversions. 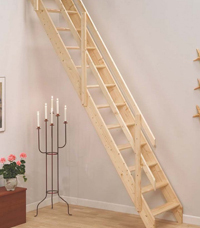 The Miller Ladder (Madrid) is an ideal option to access those difficult to reach areas. 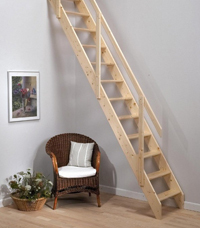 Designed to be installed one rise down from upper floor level, this ladder takes up the minimum of space and with it's ready to varnish or paint finish, it will blend into it's new surroundings instantly. The Lisbon Stair takes our exisiting Madrid Stair to a new level as it offers a wider tread dimension and it comes supplied with a double rail banister. 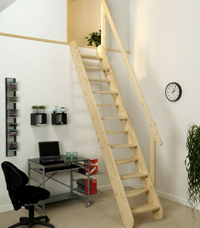 The stair is designed to be installed one rise down from upper floor level and it is an ideal option to access those difficult to reach areas. The Amsterdam makes for an ideal access solution where space is limited. With its uniquely designed delta treads and handrail issued to one side it makes for a comfortable and safe climb. The stair itself is supplied in sanded spruce ready for finishing to suit your application. 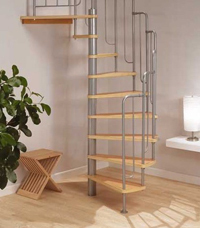 We are proud to welcome back the Gera space saver stair to our range. With its uniquely designed delta treads and adjustable stair angle it can provide the perfect solution where space is limited. The stair itself is supplied in sanded spruce ready for finishing to provide a stylish look within your application. 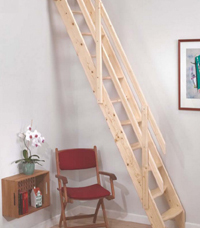 An increasingly popular choice, Spacesaver stairs are an ideal solution where space is limited. Taking up about half the space of a standard flight, the unique tread shape overcomes the problem often associated with steep stairs, enabling comfortable descent facing forward with plenty of foot room. 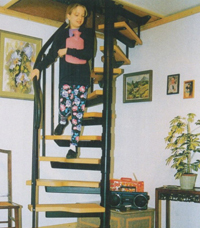 Although in use for many years, the alternating tread stair was actually included in the Building Regulations (Part K) in 1992. However, as with all stairs, it is advisable to confirm with the local Building Control Department of its suitability for any given project. The Barcelona is an ideal solution for the home with its light blend of beech treads and tubular balustrade make for an eye-catching spiral staircase. 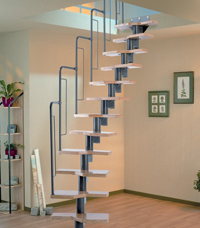 Its modern design ensures a safe and comfortable climb to the next level in your home. The Graz is a popular product from the Dolle Staircase range with cost-effective space saving due to the Graz's flexible design. The design of the metal work for the Graz enables the tread rise and angle to be adjusted. With beech multiplex treads and a painted grey metal tubular banister, the Graz makes for a stylish stair kit. The Charlotte spiral offers possibilities not achievable with traditional spirals. Requiring a minimum opening of only 1300 x 750mm, most floor to floor heights can be achieved within a half turn providing a safe stairway in the minimum of space. The Rome is a great looking staircase from the Dolle range and is the ideal solution for your home where space maybe limited. The design of the steel supports for the Rome enables the tread rise and angle to be adjusted. With beech veneered multiplex treads, a beech handrail and a wire banister with steel uprights.